Singur is a community development block that forms an administrative division in Chandannagore subdivision of Hooghly district in the Indian state of West Bengal. The Singur CD Block is part of the Hooghly-Damodar Plain, one of the three natural regions in the district, of the flat alluvial plains that forms part of the Gangetic Delta. The region has many depressions which receive water from the surrounding lands during the rainy season and discharge the water through small channels. According to Binoy Ghosh, the word “Singur” is believed to a derivative of the word “Singhapur”. In the Sri Lankan Mahavamsa there is mention of two towns – Singhapur and Banganagar, both believed to be located in the ancient Rarh region. Some scholars feel that Singur is the place where ancient Singhapur was located. According to the Sri Lankan chronicles Prince Vijaya, son of Singhabahu, king of Singhapur, sailed from Singhapur, landed in Sri Lanka in 544 BC and became the king. In those days the people of what later came to be called as Bengal were known to be seafaring and the mighty Saraswati used to flow through the Singur area. Therefore, this seems to be feasible according to some scholars, but other scholars feel that it is more hearsay than actual proven history. Singur is located at 22°49′N 88°14′E﻿ / ﻿22.81°N 88.23°E﻿ / 22.81; 88.23. Singur CD Block is bounded by Polba Dadpur CD Block in the north, Chandernagore Municipal Corporation, Bhadreswar Municipality, Champdany Municipality, Sreerampur Uttarpara CD Block in the east, Chanditala I and Chanditala II CD Blocks in the south and Haripal CD Block in the west. It is located 22 km from Chinsurah, the district headquarters. Gram panchayats of Singur block/ panchayat samiti are: Anandanagar, Bagdanga-Chinamore, Balarambati, Baruipara-Paltagarh, Basubati, Berabari, Bighati, Boinchipota, Bora, Borai-Pahalampur, Gopalnagar, Kamarkundu Gopalnagar Doluigachha, Mirjapur-Bankipur, Nasibpur, Singur I and Singur II. As per the 2011 Census of India, Singur CD Block had a total population of 276,413, of which 223,951 were rural and 52,462 were urban. There were 140,334 (51%) males and 136,079 (50%) females. Population below 6 years was 24,276. Scheduled Castes numbered 47,037 (17.02%) and Scheduled Tribes numbered 4,069 (1.47%). As per the 2001 census, Singur block had a total population of 260,729, out of which 131,286 were males and 129,443 were females. Singur block registered a population growth of -1.65 per cent during the 1991-2001 decade. Decadal growth for Hooghly district was 15.72 per cent. Decadal growth in West Bengal was 17.84 per cent. Census Towns in Singur CD Block are (2011 census figures in brackets): Balarambati (5,068), Singur (21,382), Nasibpur (7,157), Jagatnagar (5,242), Baruipara (6,737) and Borai (6,522). Large villages (with 4,000+ population) in Singur CD Block are (2011 census figures in brackets): Beraberi (6,810), Gopalnagar (12,232), Dewan Bheri (5,687), Bainchipota (4,019), Atisara (6,113), Daluigachha (4,123), Mirzapur Bankipur (5,842), Shibrambati (4,208), Basubati (4,256), Ramnagar (4,006), Pahlanpur (6,034), Bara Kamalapur (20,047) and Bighati (4,388). Other villages in Singur CD Block include (2011 census figures in brackets): Anandanagar (3,915), Bajemelia (3,659), Khaser Bheri (790) and Sinher Bheri (1,563). As per the 2011 census the total number of literates in Singur CD Block was 211,984 (84.07% of the population over 6 years) out of which males numbered 113,548 (88.77% of the male population over 6 years) and females numbered 98,436 (79.24% of the female population over 6 years). The gender disparity (the difference between female and male literacy rates) was 9.54%. As per the 2001 census, Singur block had a total literacy of 60.72 per cent. While male literacy was 79.52 per cent, female literacy was 52.49 per cent. As per the 2001 census, Bengali is the mother tongue for 86.4 % of the population of the district followed by Hindi at 7.9%. Santali at 2.6% and Urdu at 2.0%, are the two other major languages spoken in the district. The population who reported Bengali as a mother tongue has decreased from 88.1% in 1961 to 86.4% in 2001 census whereas the population who reported Hindi as mother tongue has increased from 5.8% in 1961 to 7.9% in 2001 census. As per the 2011 census, majority of the population of the district belong to the Hindu community with a population share of 82.9% followed by Muslims at 15.8%. The percentage of the Hindu population of the district has followed a decreasing trend from 87.1% in 1961 to 82.9% in the latest census 2011. On the other hand, the percentage of Muslim population has increased from 12.7% in 1961 to 15.8% in 2011 census. In the 2011 census, Hindus numbered 250,758 and formed 90.72% of the population in Singur CD Block. Muslims numbered 24,665 and formed 8.92% of the population. Others numbered 990 and formed 0.36% of the population. In 2011, Hindus numbered 4,574,569 and formed 82.89% of the population in Hooghly district. Muslims numbered 870,204 and formed 15.77% of the population. In West Bengal Hindus numbered 64,385,546 and formed 70.53% of the population. Muslims numbered 24,654,825 and formed 27.01% of the population. As per poverty estimates obtained from household survey for families living below poverty line in 2005, rural poverty in Singur CD Block was 18.39%. In Singur CD Block in 2011, amongst the class of total workers, cultivators formed 16.40%, agricultural labourers 16.34%, household industry workers 8.11% and other workers 59.15%. There are 98 inhabited villages in Singur CD Block. 100% villages have power supply. 64 villages have more than one source of drinking water (tap, well, tube well, hand pump), 23 villages have only tube well/ borewell and 9 villages have only hand pump. 9 Villages have post offices, 16 villages have sub post offices and 2 villages have post and telegraph offices. 86 villages have landlines, 51 villages have public call offices and 92 villages have mobile phone coverage. 44 villages have pucca roads and 21 villages have bus service (public/ private). 15 villages have agricultural credit societies, 15 villages have commercial/ co-operative banks and 1 village has bank ATM. Singur gained international media attention since Tata Motors started constructing a factory to manufacture their $2,500 car, the Tata Nano at Singur. The small car was scheduled to roll out of the factory by 2008. In October 2008 Tatas announced withdrawal from the project. Six villages – Bajemelia, Beraberi, Gopalnagar, Joymolla, Khaserbheri and Singherberi – were affected by land acquisition.In 2016, the Supreme Court quashed the West Bengal government’s acquisition of 997 acres of agricultural land for Tata Motors and ordered its return to 9,117 landowners. This is a rich agricultural area with several cold storages. Though rice is the prime crop of the district, the agricultural economy largely depends on potato, jute, vegetables, and orchard products. Vegetable is a prize crop in the blocks of Haripal, Singur, Chanditala, Polba and Dhaniakhali being grown in a relay system throughout the year. Though potato is cultivated in all the blocks of this district Dhaniakhali, Arambagh, Goghat, Pursurah, Haripal, Polba-Dadpur, Tarakeswar, Pandua and Singur contributed much of its production of this district. Some of the primary and other hats or markets in the Singur block area are: Kamarkundu hat, Singur market, Ratanpur hat, Bora bazaar, Beraberi market, Banipara market, Basubati hat, Bhadreswar station bazaar and Kalisori Babu bazar. The Tebhaga movement launched in 1946, in 24 Parganas district, aimed at securing for the share-croppers a better position within the existing land relation structure. Although the subsequent Bargadari Act of 1950 recognised the rights of bargadars to a higher share of crops from the land that they tilled, it was not implemented fully. Large tracts, beyond the prescribed limit of land ceiling, remained with the rich landlords. From 1977 onwards major land reforms took place in West Bengal. Land in excess of land ceiling was acquired and distributed amongst the peasants. Following land reforms land ownership pattern has undergone transformation. In 2013-14, persons engaged in agriculture in Singur CD Block could be classified as follows: bargadars 7.56%, patta (document) holders 4.06%, small farmers (possessing land between 1 and 2 hectares) 3.58%, marginal farmers (possessing land up to 1 hectare) 41.98% and agricultural labourers 42.82%. Singur CD Block had 193 fertiliser depots, 23 seed stores and 68 fair price shops in 2013-14. In 2013-14, Singur CD Block produced 48,445 tonnes of Aman paddy, the main winter crop from 17,310 hectares, 5,479 tonnes of Boro paddy (spring crop) from 1,670 hectares, 6 tonnes of Aus paddy (summer crop) from 2 hectares, 12 tonnes wheat from 5 hectares, 53,343 tonnes of jute from 2,267 hectares, 58,151 tonnes of potatoes from 3,049 hectares. It also produced oilseeds . In 2013-14, the total area irrigated in Singur CD Block was 11,086 hectares, out of which 5,605 hectares were irrigated by canal water, 1,950 hectares by tank water, 100 hectares by river lift irrigation, 1,040 hectares by deep tube wells and 2,391 hectares by shallow tube wells. In 2013-14, Singur CD Block had offices of 26 commercial banks and 4 gramin bank. Singur CD Block has 5 originating/ terminating bus routes. The broad gauge Sheoraphuli–Tarakeswar branch line was opened by the Tarkessur Railway Company on 1 January 1885 and was worked by East Indian Railway Company. The Tarkessur company was taken over by the East Indian Railway in 1915. There are stations at Nasibpur, Singur and Kamarkundu on the Howrah-Tarakeswar branch line. The Howrah–Bardhaman chord, a shorter link to Bardhaman from Howrah than the Howrah–Bardhaman main line, was constructed in 1917.There are stations at Baruipara, Mirzapur-Bankipur, Balarambati and Kamarkundu. The Howrah-Bardhaman main line passes through this CD Block and there are stations at Bhadrehwar, Mankundu and Chandannagar. The stations located in the cities/ municipal towns are outside the CD Block. It is part of Kolkata Suburban Railway system. Singur Government College, a general degree college, was established at Singur in 2013. In Singur CD Block, amongst the 98 inhabited villages, 7 villages had no school, 61 villages had more than 1 primary school, 65 villages had at least 1 primary school, 26 villages had at least 1 primary and 1 middle school and 21 villages had at least 1 middle and 1 secondary school. In 2014, Singur CD Block had 1 rural hospital, 3 primary health centres and 5 private nursing homes with total 125 beds and 10 doctors (excluding private bodies). It had 43 family welfare subcentres. 6,881 patients were treated indoor and 271,106 patients were treated outdoor in the hospitals, health centres and subcentres of the CD Block. Singur CD Block has Singur Rural Hospital (with 60 beds) at Singur, Bajemelia Primary Health Centre at PO Gopalnagar (with 10 beds), Balarambati PHC (with 10 beds) and Bora PHC with (10 beds). Singur CD Block is one of the areas of Hooghly district where ground water is affected by moderate level of arsenic contamination. The WHO guideline for arsenic in drinking water is 10 mg/ litre, and the Indian Standard value is 50 mg/ litre. In Hooghly district, 16 blocks have arsenic levels above WHO guidelines and 11 blocks above Indian standard value. The maximum concentration in Singur CD Block is 100 mg/litre. ^ "District Census Handbook: Hugli, Series-20, Part XIIA" (PDF). Physiography, Page 17. Directorate of Census Operations, West Bengal, 2011. Retrieved 1 June 2017. ^ Binoy Ghosh, Paschim Banger Sanskrititi (in Bengali), Vol II, pp. 377-383, Prakash Bhawan, 1978. ^ "District Statistical Handbook 2014 Hooghly". Tables 2.1, 2.2. Department of Statistics and Programme Implementation, Government of West Bengal. Retrieved 15 October 2018. ^ "District Census Handbook: Hugli, Series-20, Part XIIA" (PDF). Map of Hooghly with CD Block HQs and Police Stations (on the fifth page). Directorate of Census Operations, West Bengal, 2011. Retrieved 1 June 2017. ^ "Singur". Local Self-government. Hooghly Zilla Parishad. Retrieved 6 June 2017. ^ "Directory of District, Subdivision, Panchayat Samiti/ Block and Gram Panchayats in West Bengal". Hooghly – Revised in March 2008. Panchayats and Rural Development Department, Government of West Bengal. Retrieved 16 May 2016. ^ a b c d e "C.D. Block Wise Primary Census Abstract Data(PCA)". 2011 census: West Bengal – District-wise CD Blocks. Registrar General and Census Commissioner, India. Retrieved 26 May 2016. ^ "Provisional Population Totals, West Bengal. Table 4". Census of India 2001 – Hooghly district. Census Commission of India. Archived from the original on September 28, 2011. Retrieved 2011-01-20. ^ "Provisional Population Totals, West Bengal. Table 4". Census of India 2001. Census Commission of India. Archived from the original on September 27, 2007. Retrieved 2011-01-20. ^ "Singur". Local Self-government. Hooghly Zilla Parishad. Retrieved 2011-08-04. ^ a b "District Census Handbook: Hugli, Series-20, Part XIIA" (PDF). Religion, Mother-tongue Pages 50-51. Directorate of Census Operations, West Bengal, 2011. Retrieved 1 June 2017. ^ a b "C1 Population by Religious Community". West Bengal. Registrar General and Census Commissioner, India. Retrieved 3 May 2016. ^ "District Human Development Report: Hooghly" (PDF). Table 2.38: Empirical Measurement of Rural Poverty in Hooghly 2005, page 89. Development and Planning Department, Government of West Bengal, 2011. Retrieved 14 June 2017. ^ a b c d e f g h i "District Statistical Handbook 2014 Hooghly". Tables 2.7, 17.2, 16.1, 18.1, 18.2, 20.1, 21.2, 4.4, 3.1, 3.3 – arranged as per use. Department of Statistics and Programme Implementation, Government of West Bengal. Retrieved 15 October 2018. ^ a b "District Census Handbook: Hugli, Series-20, Part XIIA" (PDF). Appendices to Village Directory, 2009, Pages 775-779. Directorate of Census Operations, West Bengal, 2011. Retrieved 1 June 2017. ^ "Tata Motors' small car to roll out of Singur by 2008". The Hindu Business Line, 26 November 2006. Retrieved 3 June 2016. ^ "Tata's Singur Withdrawal 'slap' for West Bengal: Biman Bose". Two Circles.net, 4 October 2008. Retrieved 24 May 2016. ^ "Land Acquisition and Compensation: What Really Happened in Singur?" (PDF). Maitresh Ghatak, Sandip Mitra, Dilip Mookherjee, Anusha Nath. Economic and Political Weekly, 25 May 2013. Retrieved 3 June 2016. ^ "Singur: Six years later". 25 December 2012. TwoCircles.net. Retrieved 13 June 2016. ^ Rajagopal, Krishnadas. "Return land to Farmers: SC orders West Bengal govt". The Hindu, 31 August 2016. Retrieved 8 June 2017. ^ "Bengal to return Singur land to farmers on Sept 14". The Hindu Business Line, 12 September 2016. Retrieved 8 June 2017. ^ "List of functioning Cold Storage of West Bengal District wise as on 18.01.07". West Bengal State Marketing Board. Retrieved 28 January 2009. ^ "Intensive cropping with remarkable feature of Hooghly District". Archived from the original on 16 July 2011. Retrieved 28 January 2009. ^ "Primary Hats/Markets of District". Hooghly. West Bengal State Marketing Board. Retrieved 2009-01-29. ^ "District Human Development Report: South 24 Parganas". (1) Chapter 1.2, South 24 Parganas in Historical Perspective, pages 7-9 (2) Chapter 3.4, Land reforms, pages 32-33. Development & Planning Department, Government of West Bengal, 2009. Retrieved 7 August 2016. ^ "Howrah-Goghat Local 37371". India Rail Info. ^ "Adra Divisional Railway Map". South Eastern Railway. 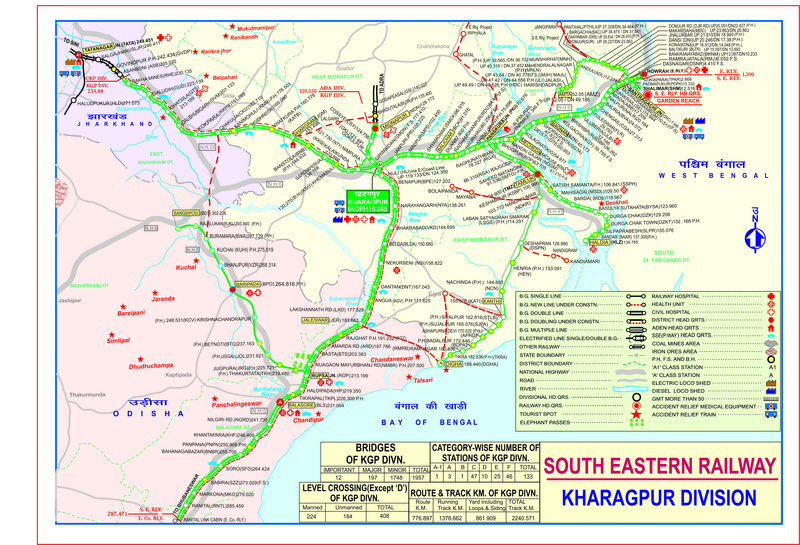 ^ "Kharagpur Divisional Railway Map". South Eastern Railway. ^ "SER Pink Book 2018-19" (PDF). Indian Railways. ^ "The Chronology of Railway development in Eastern Indian". railindia. Archived from the original on 2008-03-16. Retrieved 2011-11-17. ^ "Statistical abstract relating to British India from 1910-11 to 1919-20" London: His Majesty's Stationery Office 1922, which is on a DSAL statistical site at the University of Chicago. ^ "37361 => 37311 Howrah-Tarakeswar Local". Time Table. indiarailinfo. Retrieved 8 June 2017. ^ "36811 Howrah Bardhaman Jn Chord Local". Time Table. indiarailinfo. Retrieved 8 June 2017. ^ "37815 Howrah Bardhaman Jn Local". Time Table. indiarailinfo. Retrieved 13 June 2017. ^ "Rationalisation of Numbering Systems of National Highways" (PDF). New Delhi: Department of Road Transport and Highways. Retrieved 10 February 2017. ^ "List of State Highways in West Bengal". West Bengal Traffic Police. Retrieved 23 August 2016. ^ "Government General Degree College, Singur". Singur Government College. Retrieved 30 June 2017. ^ "Singur Government General Degree College". College Admission. Retrieved 30 June 2017. ^ "Health & Family Welfare Department". Health Statistics. Government of West Bengal. Retrieved 15 July 2017. ^ "Groundwater Arsenic contamination in West Bengal-India (20 years study )". Hugli. SOES. Retrieved 3 June 2017.